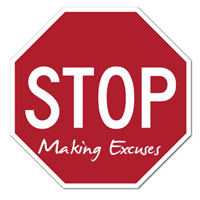 It seems to be human nature for people to make excuses for themselves. People always want to justify their actions. Many of us like the idea of starting a diet, but too many of us have an excuse as to why we never get around to it. Below is a list of some of the most irritating diet excuses people use in order to justify their weight. Diets will not work for me. If people do not diet, then of course they will not work. People must actually work to lost the weight. My hormones are why I’m fat. It is easy to blame hormones for many bodily functions however, this is something that can be overcome with regular exercise, a healthy diet, and if needed medical attention. Being fat is in my genes. Many people like to use this excuse because it gives them a reason to feel their health it is out of their hands. Some people might say, “Well, my mom is overweight. All of her family is overweight. That must mean that I have no choice but to be overweight!” While genes may have some effect on a person’s weight, it does not rule that person’s life. Regular exercise and a healthy diet will still help a person who has an overweight family. Um…..NO! After regular diet and exercise, many people have found that their build is in fact A LOT smaller than they originally thought it was. Bones are not what make people fat, fat is what makes people fat. I am not fat, I just have a lot of water retention. The human body is made up of 70% water. This does not make every person overweight. High Water retention is a sign of larger health issues. It’s impossible to eat regular, healthy meals. Busy schedules make it challenging for a lot of families to eat a meal together every day. But this does not give people the justification to eat fast and unhealthy meals ALL OF THE TIME. There are lots of healthy foods available to eat instead of fast food. I am fat because I have a slow metabolism. Regular exercise increases a persons metabolism. If people with slow metabolisms just exercised a little more, they could significantly decrease their weight! Look at it as killing two birds with one stone! I can not start my diet today, because it is not Monday and everyone knows that diets will only be successful if they are started on Monday. Right. Everyone knows this. How can I even argue this? Of course, excess body weight only goes away if it’s in agreement with the calendar. It’s OK to eat this… it’s small and can’t possibly have a lot of calories. This may be hard to hear, but many small pieces of food (chocolate, chicken nuggets, etc.) carry with them a high number of calories. I will start my diet tomorrow. “Tomorrow is another day” is a very popular saying for a reason. Unfortunately for many, tomorrow never comes. Maybe a better way to think of all of these excuses are as “challenges” instead. If a person views these points as challenges as to why they are overweight, then maybe they can find the motivation to overcome the challenges they face. Many people will be surprised to see what regular exercise and a healthy diet will actually do for them… If they’re ready. Now that you have read the article and agree to take excuses as challenges, then you may want to select a healthy and proven diet plan to embark on. Have you heard what is the Atkins diet all about? Well, the Atkins diet have been around for about 4 decades and have helped millions of people all over the world to lose weight successfully. But do remember to take a before and after picture of yourself as a souvenir. Ernesto is a self proclaimed health expert that loves everything fitness. He is also the editor of My Lifestyle Diet where he and his staff review popular diets like Weight Watchers Online.